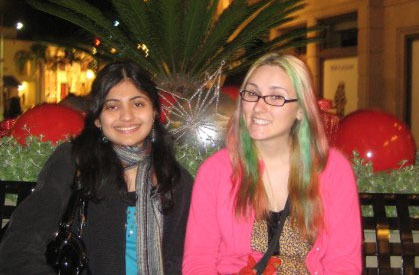 Shaheda and I had a serious conversation about ghosts during a trip to L.A. in December 2009. Shahedaâ€™s belief in ghosts seemed silly when I first considered it. It was hard for me to take the supernatural seriously while we sat on a bench in the Koreatown district of Los Angeles, watching crowds of people shuffle past us into the nearby shops or Metro station. But as I learned about the cultural roots of Shahedaâ€™s belief in ghosts, I couldnâ€™t help but feel like the silly one. The two of us had come to L.A. on a service trip with a handful of other students from Northwestern University. Shaheda had just completed her final quarter and was looking ahead to securing a job. She had left India with her family when she was 18 and moved to Chicago, where she attended a local city college before transferring to Northwestern as a junior. I learned a lot about Shahedaâ€™s life while we chatted on the bench, but the turning point in our conversation came when she asked about ghosts. Back on our first night in L.A., a man teased our group by telling us that people occasionally encountered ghosts near our sleeping quarters. Some of the girls became unnerved at the mention of ghosts and began going to the bathroom in pairs so they wouldnâ€™t have to walk in the hallway alone. When Shaheda asked if I thought there really were ghosts, I assumed she probably felt spooked like the rest of the girls so I told her it was only a story the man invented to give us the creeps. I soon realized just how seriously Shaheda had taken the manâ€™s teasing about ghosts. Shaheda explained that several of her relatives had seen ghosts before, so after she heard there might be spirits hanging around the place we slept, she tried her best to avoid coming across one while she walked alone in the hallway. Shaheda said people living throughout India believe the souls of those who die violently donâ€™t always rest in peace. Instead, they are often seen by the living, usually near the sites where they died.Â Â One of Shahedaâ€™s neighbors back in India used to see a female ghost strolling down the street every night. The neighbor said it was the spirit of a woman who had died in a fire. As Shaheda explained why she believed in ghosts, my incredulity began melting away. Who was I to say whether or not the belief of another culture was unfounded? A cultural belief is not something that mere conversation can smooth over. There was nothing I could say to ease Shahedaâ€™s concerns, other than to tell her I thought the man was merely teasing about the ghosts. By the time Shaheda and I met up with the rest of our group, my water bottle was empty and I felt parched from our long conversation. My dry throat kept me from saying much as we walked through the busy L.A. streets, but this gave me a chance to ponder my own culture in light of the things Shaheda and I had discussed, and whether I should reconsider walking in the hallways alone.